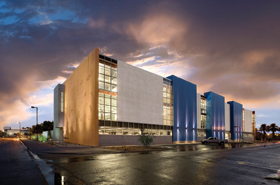 The building is clad in tilted, sliced, and angled cement-board panels. 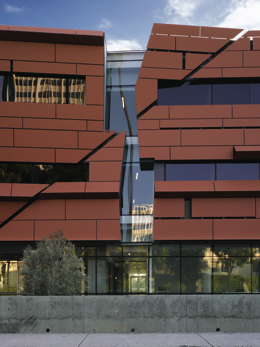 Morphosis’ newly opened Cahill Center for Astronomy and Astrophysics at Caltech in Pasadena is among the firm’s more subdued works. Low-slung and clad in Swiss Pearl cement-board panels the color of aged terra cotta, the three-story building lies along California Boulevard like a chunk of displaced red-rock sandstone. Although the facade is cracked and tilted, its small scale, combined with the soft, warm color, lends the science facility a sense of repose—an attitude not usually associated with the brazen architect Thom Mayne. The building looks restrained, but not too much, as if it had recently suffered damage in an earthquake. Anyone driving along the boulevard looking for the Caltech Seismological Laboratory can be forgiven for thinking he’s arrived at the world-famous earthquake lab—which is actually next door in a rather plain and decidedly un-seismological Spanish colonial revival. 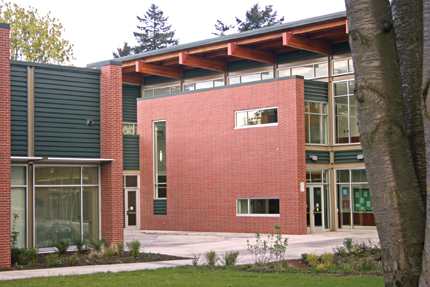 The confusion is cued by the features that make the Cahill building unique. On the exterior, vertical planes not only list to either side of 90 degrees, but also appear to have shifted horizontally relative to one another, much the way two pieces of the Earth’s crust slip along a fault. Dark, deep, diagonal voids, left without the cement-board cladding, emphasize these thrusting plates. 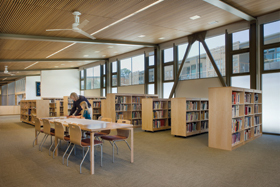 Inside, the $50 million, 100,000-square-foot center contains classrooms, offices, underground labs, a public auditorium, and a library. 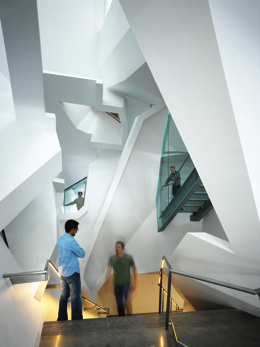 The initial focus is a dramatic, white, central staircase that is supposed to be about astronomy. The stair is what you notice first upon entering the lobby, and it’s all about light—the key component to understanding the cosmos. The firm developed a circulation shaft made up of walls that look like shards of light refracted through the lens of a telescope. These fractured walls cascade and collide, come to a knife’s edge, or seem to extend to infinity. 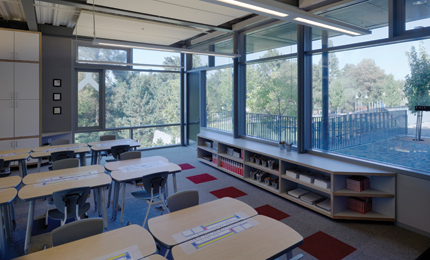 Windows allow sunlight to fall on the walls, casting long, flat beams and truncated wide ones, as well as trapezoids of shadow, depending on which piece of wall the light hits. At the pinnacle of the stairs is an oculus, an undisguised reference to the telescope and to the human desire to ponder the heavens. Meanwhile, stair treads alternate between concrete and steel mesh, between solid and void, impenetrable and clear, meant to suggest the dance of scientific exploration. Deep, diagonal voids (top) emphasize the thrusting plates. the central stair (above) transports, and disorients, visitors. On the upper two floors, the hallways jog and bump, never following a straight line along the 350-foot length of the building. Mayne has said he wanted to “attack the institutional nature of an entity. The wiggle (in the corridors) is more relaxed, more like a medieval city, like Sienna.” The idea, really a commonplace, makes offices less isolating by making the hallways more collegial. 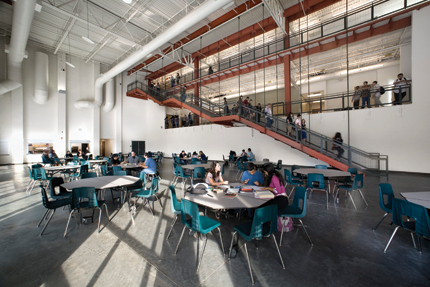 The firm has placed large windows with window seats at the ends of four hallways that bisect the floors. Mayne has dubbed these physical breaks “stitches.” The windows frame views of the campus and the soaring San Gabriel Mountains to the north and the flats of San Marino to the south. These are pleasant, quasi-public spaces in which you can imagine overhearing chit-chat on the imponderable essense of, say, dark matter. Throughout the project, Morphosis has transferred the tilts and slants of the exterior to the interior, producing a strange, dizzying effect. East-facing walls slant east, west-facing walls slant west. 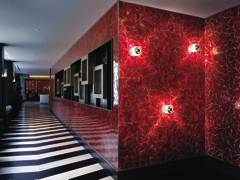 The hallway walls tilt in one direction from the floor up and another from the ceiling down—creating a modified chevron, or boomerang-shaped space. Those corridors are also painted in powdery hues (one floor sports an aqueous blue reminiscent of Neil Denari’s palette). Of course, there is nothing new about sloped walls, just as there is no surprise that such walls can throw the human body off-kilter. It is unclear if Mayne wants these walls to actually put the body off-balance or if he sees them strictly as metaphors for the dynamic, unsettling forces at work in the universe. Unfortunately, the metaphor, intended or not, has become reality, and the question is whether the congenial window-seat hang-outs will provide a sufficient antidote to the vertiginous walls that line every hallway, conference room, office, and grad student’s cell. 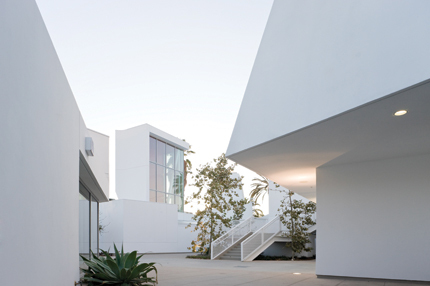 At bottom, Mayne is an architect who isn’t especially comfortable using form to induce feeling. When he delivers a sensation, he does so with a body-blow—such as the doom you feel as a lonely pedestrian, passing beneath the overhanging weight of the Caltrans building in downtown Los Angeles. More often his work is about conveying a visual punch. His buildings are generally experienced as an in-your-face wallop, and less as a subtle accumulation of critical moments or passages more felt than seen. 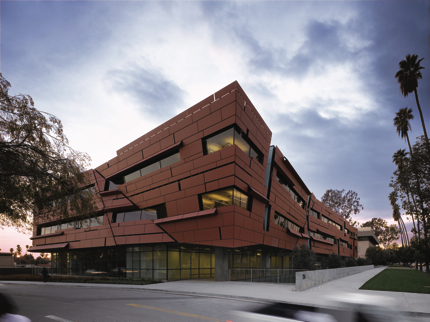 The new Caltech building is agreeably lively as a surface and as a volume that looks as if it is falling to pieces. The central staircase speaks eloquently to the search for knowledge buried in the mysteries of deep space and time. Yet the building lacks Mayne’s characteristic bravura, his willingness to take a great leap, however messy the result. The building looks like a repetition of so many other Morphosis projects, only scaled down and scaled back. Several decades ago, the intellectual historian Thomas Kuhn wrote in The Structure of Scientific Revolutions that science, like evolution and history, grows by leaps and bounds, rather than in a steady, linear fashion. Mayne knows this to be true about architecture. 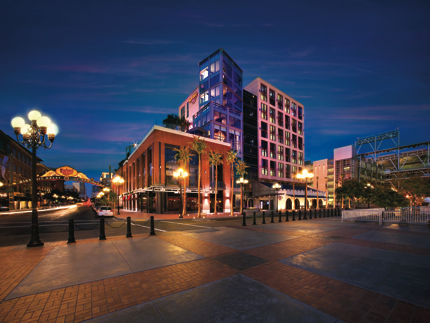 Launched in 2006 by LA planning director Gail Goldberg, the Urban Design Studio was created to address the city’s lack of urban design standards and to create a more pedestrian-friendly city. The small studio, headed by planners Emily Gabel-Luddy, and Simon Pastucha has already spearheaded the recent creation and approval of a set of Downtown Street & Urban Design Standards and Guidelines, which encourages wider sidewalks (at least 15 feet on some downtown blocks) and the possibility of street life, and a set of Walkability Guidelines. The Architect’s Newspaper sat down with the duo to discuss these, as well as their most ambitious endeavor: 11 Urban Design Principles, a set of values to which developers would be required to subscribe when seeking entitlements. The principles range from “reinforce walkability and well-being” to “nurture neighborhood character” to “bridge the past and the future.” They are intended as “the first step to the creation of great streets, open spaces, and a more livable city.” If adopted by the City Council, these principles will be included in the city’s general plan, become part of the findings required for any discretionary action by the city, and eventually be interwoven in the 35 community plans throughout the city. The Planning Commission will consider them within the next two months. AN: The truth underlying the Urban Design Principles is that all the great cities of the world came into being based on the human scale and prior to the advent of automobiles, and it’s the design studio’s intent to focus back to the human scale. Give me a practical example of what sort of implementation that might entail. Emily Gabel-Luddy: Let me go to the Street Standards in Downtown Los Angeles. It was our goal that the city move away from an auto-centric proposition to one that emphasizes the pedestrian and mass transit. And so we spearheaded the idea of 15-foot-minimum-wide sidewalks in the dense urban core of our city. The reason this is so significant is because it lets all the developers and property owners have so much more room to put their outdoor café accessories—their tables and chairs—which in turn begins to cultivate the kind of social commerce among neighborhoods, residents, and office workers that was really part of cities prior to the automobile playing such an overriding part in how the public realm is defined and utilized. 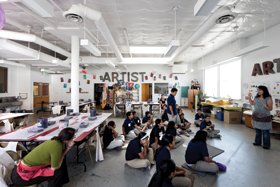 AN: How will the Urban Design Principles dovetail into existing neighborhood plans? Don’t architects have enough regulations on their plate already? Simon Pastucha: Both the Urban Design Principles and the Downtown Design Standards are set up as a set of ideas to incorporate into your design. They’re not a set of standard requirements saying that you have to have ‘this’ at a certain point or a certain place. They just say: How do you meet the intent of these? EGL: It’s not a design review, it’s not an ordinance.  It says: Here’s the value, now tell us how your project has achieved that value. I don’t think true design comes from telling architects how to design their buildings. 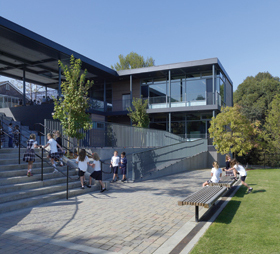 True design comes from having the architect reflect on how that building achieves value that is expressed in a way that is appropriate to a local community. AN: When we talk about design that reinforces a neighborhood’s character, aren’t we entering the realm of the taste police? EGL: I disagree with you on that. To me, what we’re talking about when we’re nurturing neighborhood character is, when a new project comes in—and sure, it may be a little higher density, because that’s what the zoning allows—but the articulation of the houses and the townhouses, they still face the street. Because we still want that street to have the sense that there are people in relationship to one another when they come out of their doors in the morning. Now, to me, that’s not the design police. That’s wading into a larger issue of community building or community sustaining without saying you must do absolute replicas of bungalows or absolute replicas of what’s across the street or on the other side of you. AN: Each of you has a strong connection to design and yet both chose to be planners. What is that about? SP: I love going to other cities and I love exploring cities that are not aesthetically so pretty but the streets are full of life. And the people are using the buildings just like they would a really pretty building. It’s still about the bones and functioning well. People can adapt the building. I look at it and go, “my role as an urban designer is to make the street successful and the buildings relate to the street” and that makes people use it. EGL: And that is 98 percent of the kinds of development we see in the city. The two percent are going to be the Rem Koolhaas-es, the architects that are going to be afforded a big commission to do a significant piece of architecture like a Broad Museum. Those come along two percent of the time. And I think architects and architectural critics tend to focus on those. One of the dangers of that is having architecture continue to be irrelevant to the masses of folks, who actually use and appreciate buildings that function on their behalf. Peter Eisenman was giving a lecture about a building that he did in Tokyo. And.. he was having such delight in the fact that the floors and the stairs were uneven and that they would force the patron to keep an eye on where they were stepping and walking. So his whole idea was playing games with the form which I think is okay, but it wasn’t about the ease of use and the ability for folks to…enjoy the atmosphere. Architects always run the risk of becoming completely irrelevant. 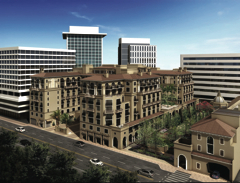 After two decades of contentious community debate and fierce parochial politics, a major mixed-use development, Palazzo, has opened its doors in Westwood Village. Let the debates continue, for if nothing else, the project points to a disturbing drift in the design world, where heralded mixed-use projects do not necessarily translate into accessible urbanity as promised, but rather into economically isolating banality—at least in this less than inspiring instance. 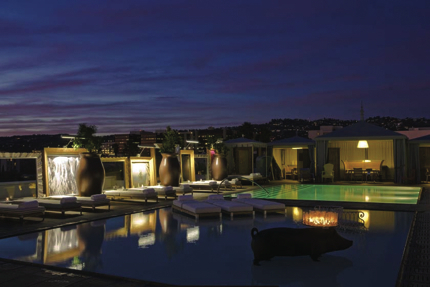 Woe to Westwood, now promoting as its new heart the Palazzo’s 350 luxury apartments, an array of gilt-edge amenities, a cavernous 1,252-space garage, and 50,000 square feet of mostly high-end retail and restaurants. 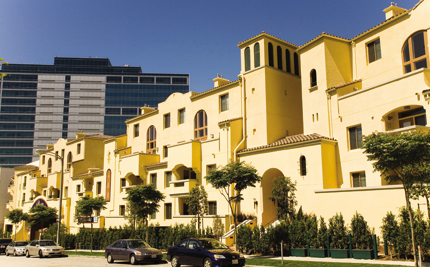 Shoe-horned onto the four-plus acre site and shrouded in a nauseating canary yellow, the heavily hyped development has all the charm of an extended-stay mid-city hotel residence. It is more citadel than community. A Casden Properties conceit, it was designed with an experienced if predictable hand by the venerable firm of Van Tilburg Banvard & Soderburgh in the all-too-familiar Spanish colonial style that has carpeted swaths of sprawling Southern California over the last quarter century. To be sure, the apartments seem to work, deftly maximizing light and air in limited interiors in no fewer than 17 different floor plans. The now-standard gourmet kitchens replete with granite countertops and spacious closets are attractive. But the attempt to clad the exterior in an Andalusian mode of bygone Westwood is more boorish than Moorish. The detailing that distinguishes the style is just not there, no doubt a budget consideration by the infamously cost-conscious CEO Alan Casden, with whom Van Tilburg has worked before. The project’s aggressive sales pitch may play off of the cultural attractions and conveniences of the adjacent UCLA megacosm, but with rents in the $4 per square foot per month range—one bedrooms are listed starting at $2,940, two bedrooms at $3,875—the Palazzo is more in tune with NYU and New York real estate prices than LA’s. And let us not forget the rock climbing wall and concierge service. We are talking here of “a secluded five-star resort with the advantages of stepping out your door into a vibrant and dynamic cityscape,” in the words of Casden that hint at [Grove developer Rick] Caruso envy. How “dynamic” that cityscape will be is questionable. Clearly, neither Palazzo’s residences and retail nor its streetscaping are designed to serve the penny-pinching, poor-tipping college crowd that in the past so animated Westwood and made it particularly attractive to that forever-18 crowd. Especially fun were the weekend nights when the village’s array of first-run landmark movie theaters existed. For a while, it was LA’s premier pedestrian scene. But that scene has long languished, following several nasty incidents over the past few decades that prompted a security-concerned UCLA to try to keep its students on campus by providing more on-site housing and diversions. Meanwhile, the obtrusive wannabe Bruin teenagers from the Valley who used to hang out in the village flocked to Santa Monica’s Third Street Promenade and elsewhere to act out. Casden was quite direct in his remarks at the opening, declaring that the hope of the Palazzo is that it will attract deep-pocketed residents and visitors to the faded village, and spur its revitalization and property values, even in these tough times. Echoing this hope for a new community in Westwood of “new people and new top-tier retailers” was Mayor Antonio Villaraigosa, ever alert to both old and new campaign contributors. Conversely, that heralded revitalization was the paramount fear of those objecting to the project during its protracted planning stage, as they quixotically clung to a nostalgic vision of the area’s past as a comfortable college town catering to both students and the surrounding community of postgraduates and professionals. In addition, the feeling was that Westwood did not need to become a regional attraction to pump up its real estate, and in fact was potentially more valuable as a modest yet distinctive development. Westwood Village was indeed once a village, designed in a fanciful Spanish style and in a suburban spirit to serve a burgeoning Los Angeles in the Roaring '20s. Planned by one of the more acclaimed land use designers of the time, Harland Bartholomew, the village was the focal point of a high-end housing tract developed by the Janss Corporation, adjacent to a new campus for UCLA that had outgrown its downtown location. Nevertheless, the hyped development dollars and anticipated local taxes that an ambitious high-end mixed-use project would divert from the adjacent wealthy municipal enclaves of Beverly Hills and Santa Monica was too much for the city of Los Angeles to ignore, even if it meant enduring some raucous public hearings and nasty press and turning its backs on UCLA’s fast-food and fast-forward crowd. The politically-connected Casden persevered, cheered on by local real estate interests and city economists, who see the village’s future and their profits pinned to high-end development. And if the mixed-use Palazzo doesn’t quite work as hoped, and Westwood slips further into somnolence, perhaps a streetcar going up and down Glendon Avenue would help, just like at the Grove and the Americana. They are all beginning to look the same, anyway. LA Times critic Christopher Hawthorne yesterday summed up the problems with L.A. Live!, the behemoth development in Downtown LA's South Park district, whose second phase is now opening. Hawthorne decries its "placelessness," its buildings that "have almost nothing to say to or about downtown Los Angeles," and worst of all, its inability to help the rest of the area. "When we trap the energy of an urban crowd inside this sort of self-contained world," he writes, "and when we allow developers and their architects to heighten the differences between that world and the streets around it so dramatically, we help keep the rest of our blocks underused and, as pieces of the city, undernourished." Amen brother. 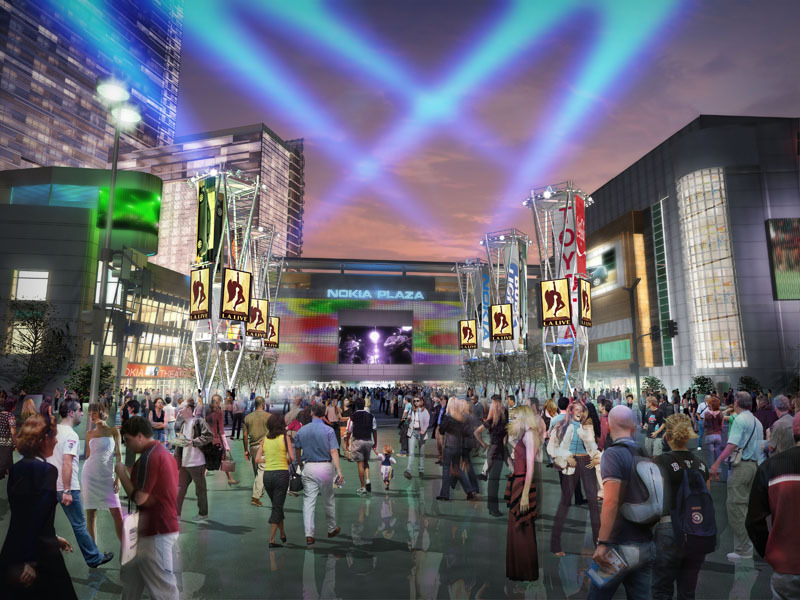 While the development, with its mix of residences, hotels and entertainment venues, should certainly bring activity and money downtown in tough times, it is still a wasted opportunity. The promenade will borrow design cues from San Pedro's maritime industrial history. A surreal area long dominated by towering steel shipping facilities may be about to get a friendlier, more community-oriented focus. The Los Angeles Harbor Department and the U.S. Army Corps of Engineers (USACE) in October released the Draft Environmental Impact Report (EIR) for their San Pedro Waterfront plan. The 400-acre project is set to replace the Port of Los Angeles' now-relocated industrial ports and docklands along the west side of Los Angeles Harbor's Main Channel with a new promenade, bike paths, park spaces, commercial spaces, and cruise ship facilities. Following a public review phase that ends on December 8, the plan would take about five to seven years to complete. Groundbreaking is set for summer 2010. 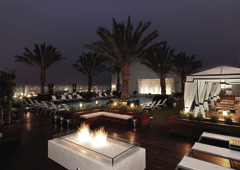 LA-based Tetra Design is coordinating the project. 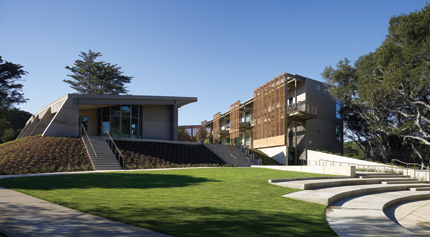 EDAW's LA and San Francisco offices are developing the master plan, landscaping, and urban design. And Oakland-based Hood Design and Pasadena-based Cityworks are assisting with landscape and urban design. Costs are still being estimated, but the port is setting aside $60 million for the project. The port said the scheme would help revitalize San Pedro in addition to providing much-needed recreation opportunities. According to estimates provided by the port, the plan would provide over 1,000 new jobs, about $38 million in new wages, and about $30.8 million in passenger spending. The plan's waterfront promenade would include an 8-mile-long, 30-foot-wide pedestrian path stretching from the Cabrillo Bath House at the south end to the Vincent Thomas Bridge to the north. The plan also proposes two new harbors—the 75,000-square-foot Downtown Harbor, and the slightly smaller 7th Street Harbor—to accommodate visiting cruise ships and other vessels. Among the plan's several (and interconnected) new public parks would be the Town Square, at the foot of San Pedro's Sixth Street; the 7th Street Landing, adjacent to the new 7th Street Harbor; and an 18-acre central park that would include an amphitheater seating up to 3,000 people. The area's existing ports of call would be enhanced with 375,000 square feet of complementary development including commercial, retail, and restaurant uses. Finally, the plan calls for two new two-story, 200,000-square-foot cruise ship terminals along the area's outer harbor. While architectural choices have yet to be made (schematic design begins in January), EDAW says the plan will focus all uses on the water, with a continuous waterfront and various districts within this stretch merging the public realm with the area's already-existing waterfront activities. Part of that, pointed out Sacha Schwarzkopf, senior urban designer for EDAW, is drawing on the existing drama that the channel presents. "One of the things that San Pedro has to offer is that you can have ships at the curb," he said. "Cruise ships. Tall ships. Industrial ships. Having that sense of awe looking at them is a very unique experience." 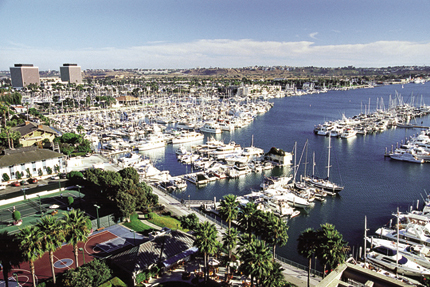 According to the EIR, plans would also draw for inspiration on the city's "maritime industrial history" as well as on the unique character of San Pedro. To help people get to all of these new facilities, the plan will include a series of transportation improvements, including the expansion of existing roadways; intersection, landscape, and parking improvements; extension of the Waterfront Red Car Line (which will run parallel to the promenade); and water taxi berthing facilities. And to protect the environment the plan pledges to use recycled water for landscaping; drought-tolerant plants; LEED certification for all buildings over 7,500 square feet; solar power; and pedestrian and bike connections throughout. Yet to some in the area, these efforts are not enough. Local web site Curbed LA described the plan as a "Disneyesque happy land of shops, tourists, and cruise ships," and pointed to comments by June Burlingame Smith, who heads up a port advisory panel overseeing the waterfront planning. "The current plan is a 'drive-by' plan," she said. "Drive by the waterfront; drive by downtown San Pedro; drive by the museums, monuments, restaurants and shops, to get to a cruise ship where dreams of happiness will be found in faraway foreign playgrounds." Schwarzkopf disagreed: "We're not trying to make this themed. There wants to be a nice waterfront layer to it, but it has to feel real. San Pedro is about muscle and it's about working ports that are right at your doorstep. It's about honest, genuine development." Clockwise from top: Inside the entrance wedge; dynamic geometries in a hallway; the house entrance. 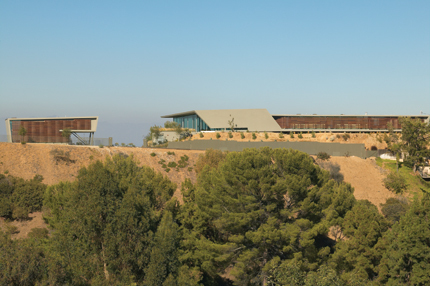 One of the biggest challenges for architect Hagy Belzberg in creating his Skyline residence in Laurel Canyon was getting permission to build. 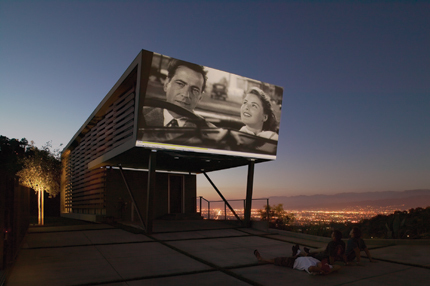 It took him two years and several public meetings to convince officials at the Mulholland Scenic Corridor to allow him to site his home on a thin ridgeline with panoramic views that include Downtown Los Angeles, the San Fernando Valley, and even the Pacific Ocean. But it was worth the effort. 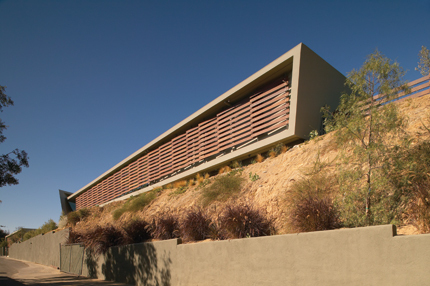 After securing the site, Belzberg was able to create a budget and eco-conscious home for his family of four that maximized the location’s breathtaking views and comfortable breezes from the west while minimizing sun glare. The keys to both limiting and profiting from the elements are two structures to the south: a large, folded concrete armature and a screen made of long, thin, pressure-treated wood panels (which allows air to penetrate the house) in front of a translucent fiberglass screen. Hence the dramatic living room, which has floor-to-ceiling fritted glass on three sides and looks down on the rocky canyons below. The room receives no direct sunlight, nor does the wide open kitchen and adjoining entertainment room, from where a long row of windows looks over the landscape abutting the house, containing a thin pool edged up against a sheer drop. 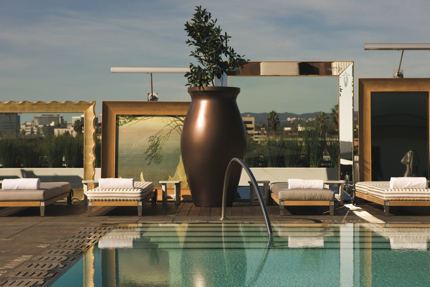 Three bedrooms provide uninterrupted views and direct access to the pool area. 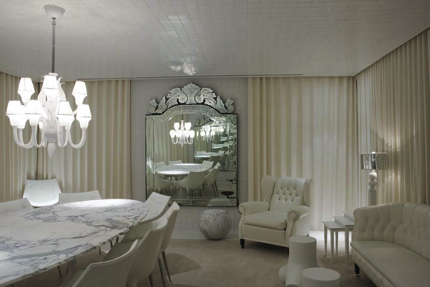 Spaces that don’t “require” views, like bathrooms and closets, are located along a long core in the house’s center. 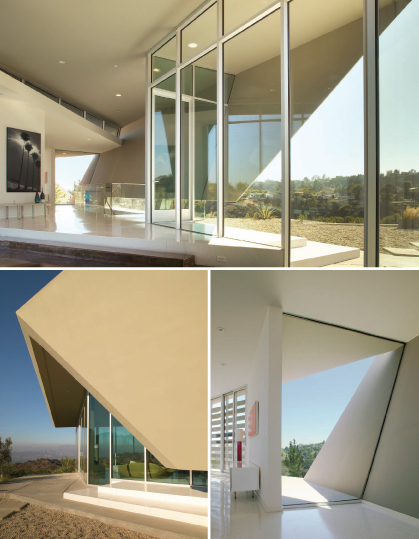 The simple home—both the main house and the guest house are enclosed by a single folded surface with infill glazing—was built by younger associates at Belzberg’s firm, serving as a valuable training tool. The crew, who stabilized the house by digging 22-foot piles, was able to create a house that is naturally green while using inexpensive, low-tech materials like storefront windows and off-the-shelf parts that kept costs to a minimum. THE SOUTH FACADE WITH BAFFLING SCREEN (TOP); The guesthouse is positioned west of the main house (middle); and the house's cinematic courtyard (ABOVE). 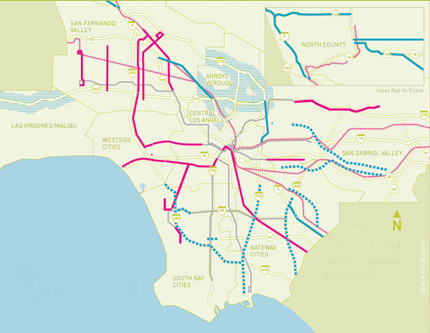 A map of METRO's proposed road and rail extensions, pending the passage of Measure R.
One of the handful of state and local initiatives on the ballot this November, Measure R, sponsored by Los Angeles County Metropolitan Transportation Authority (Metro), looks to provide $40 billion over 30 years to fund both future and ongoing transportation projects within the county. Before I get into the ineptitude of Metro’s long range planning and their lack of a system-wide approach to providing transportation to the region, let me say first that any vote for public mass transportation is a good investment. Therefore, I support Measure R on the November 2008 ballot. However, Metro is pondering other funding sources that I oppose, several projects that should not be funded, and several other projects that need some serious guidance. It has been said that if you build it they will come. If Metro successfully builds its planned expansion of the High Occupancy Vehicle (HOV) lanes on every freeway in Los Angeles County as stated in their 2008 Draft Long Range Transportation Plan (LRTP), released this summer, then we will certainly have more cars and congestion to deal with (20 percent of funding from Measure R will go to HOV lane expansion and other highway improvements). The Southern California Association of Governments (SCAG), a six-county Metropolitan Planning Organization that includes Los Angeles, Ventura, Orange, San Bernardino, Riverside, and Imperial counties, expects over six million more people in the region by 2035. With every major freeway built to its right-of-way, and virtually no support to bulldoze entire neighborhoods to build more freeways, it seems like southern California has reached its limit on freeway expansions. So Metro has decided to make our highways more efficient with a seamless HOV lane system. God help us if every freeway becomes a double decker I-110 knock off where instead of the current impermeable trench dividing our community we have large impermeable walls of loud, polluting automobiles. While we should be encouraging people who do not have any options other than the automobile to carpool, why does Metro not seek to get at the heart of the problem and build more transit to more places, making the entire transportation system more efficient, instead of just our freeways? And why can they not see that creating more efficient freeways increases the capacity for more cars on the road, creating more congestion and a continued land use nightmare of single-family home subdivisions gobbling up dwindling farmland and desert at our urban periphery? Now Metro tells us that we should seek more funding to expand transit by generating new sources of revenue on top of their latest ballot initiative. Their answer is to take some of these existing HOV lanes and transform them into High Occupancy Toll (HOT) lanes. Again, why would we now tax those who are doing what we want them to do, carpool, and then allow other single occupancy vehicles to pay to enter these specialty lanes? Metro transit engineers and policymakers claim that an HOT lane is more efficient then any free HOV lane because you can essentially price out much of the traffic during peak times, allowing a free flowing HOT lane. This congestion pricing scheme would make total sense if there was not already an existing HOV lane, plus thousands of carpoolers who already use these lanes, reducing the congestion on our freeways. The fact that these HOV lanes are becoming more and more congested is a positive sign that we are changing people’s habits, and more HOV lanes should be built to accommodate this shift. Instead of the HOT lane, why not create a countywide congestion pricing zone, and charge everyone who drives into the county except for those who use our HOV lanes? This would surely make more money than any other congestion pricing scheme for Metro, and it would deter the number one culprit of our congestion problem, the single occupancy vehicle. And similar to the HOT lane strategy, all funds from this toll would then go into building alternatives, i.e., more mass transit. This brings me to my second point. Metro is currently studying a Regional Connector transit line that they claim is needed to join the 7th and Metro transit station, which is the terminus of the Metro Blue Line light rail, to Union Station, connecting all three transit lines (Metro Blue light rail, Gold light rail, and eventually the Expo Line light rail to Culver City) in downtown Los Angeles. Well it just so happens we do have a train that links the 7th and Metro station to Union Station and the Gold Line. It is called the Metro Red Line subway. So, why are they spending millions of taxpayer dollars to study a route that would duplicate existing infrastructure, add only two or three more stations, and not even extend to Union Station but to the Gold Line station on 1st and Alameda Streets (currently under construction as part of the Gold Line eastside extension project)? Why not take that $650–$800 million and use it for more worthy and pressing projects? City Council member Jose Huizar is having trouble funding his streetcar down Broadway in downtown Los Angeles. With an estimated cost of around $90 million, why not build the Broadway street car line plus eight or nine other street car lines in downtown? This would be a much more logical use of the allocated funds to the poorly conceived regional connector. I can think of several other streets of equal length that could use a rebirth of the streetcar in addition to the proposed Broadway line: 1st Street, 4th Street, 7th Street, Olympic/9th Street, Grand Avenue, Main Street, and Alameda Street, with one or two more lines to spare. Or what about using the money for Metro’s proposed Purple Line extension? The Purple Line subway currently runs west from Union Station heading along Wilshire Boulevard to Western Avenue. An extension west along Wilshire would be the primary east-west arterial through the county, and Wilshire would have all the appropriate density and infrastructure to support a subway. It would connect an extensive part of the Westside to downtown, and it would immediately pull thousands of people out of their cars everyday. An extension that should be all subway, all the way to Santa Monica along Wilshire. I know I have posed a lot of questions for Metro, but they have given me—and the general public—even fewer answers.